Hampshire Telegraph and Post, March 11, 1949. “Fontley or Funtley?” For generations this question has taxed the minds of the residents of this small village, two miles north of Fareham. Nor is it yet agreed which is correct. 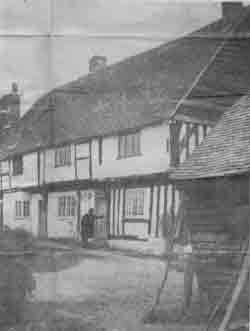 The postal address has been changed twice in 50 years, causing the village postmaster (Mr. B. Barlow) no little concern. But history shows that the word “Funt” (a watering-place) and “Ley” (a meadow) are both Saxon words, whereas “Font” is Norman in origin, so accuracy decrees that Funtley shall be the name. Whatever the pronunciation, there is no doubt of the historical interest of Funtley, which can trace back its story to Saxon times. Sadly, much of the intermediate history of the village is lacking, and it is not until comparatively recent times that the thread can be picked up. Like many Meon Valley villages, Funtley has associations with the Domesday Book, the mill being one of the three in the district mentioned in it. In fact, Funtley mill is reputed to be the first mill built on the Meon. No longer used in its former capacity, Funtley Mill still retains much of its antiquity. -H.T.2935. The mill is no longer in use, but some of the ancient structure still remains. It was on the Meon, not far from the mill, that the Jutish “Meonwara” tribe made the first attempts known in the country at irrigation, traces of which may still be seen. During the 19th Century, iron from Sweden was conveyed up the Meon to the mill, where the equipment for the first British “Ironclads” was rolled. There was much work done for the Navy here, making equipment for ships, and until recently, two canons (sic) bore eloquent testimony of the work carried on in what is now a picturesque copse. Another recent loss was the water-wheel, which provided the power for the mill. This was removed about 30 years ago, but the housing for it remains. More than 100 years old, the midget church continues to fulfil the needs of the community. H.T.2937. In 1850 the present Funtley School was built half-way up Funtley Hill, and the “Brick-makers’ Church,” as it was fondly known by the residents, became a church in its own right. Wheeling tiles into a kiln is one of the regular features of the day's work at the Brick and Tile Works. -H.T.2938. Standing at the foot of the hill, the brick and tile works does not enhance the beauty of the village, but its value as regards employment is inestimable. At present about one-third of the employees at the works are Funtley residents, this number constituting almost all the available manpower in the village. The brick and tile works has been operating for several centuries in the village on different sites, and it was at Funtley that the renowned “Fareham Red” was produced, a brick that has been incorporated in London museums, Guy’s Hospital, and the Winchester Barracks. In 1850 a thousand of these bricks were sent out to Africa. More recently a large quantity of the bricks have been used in the new Portsmouth housing schemes. Large clay deposits in the neighbourhood of Funtley account for the growth and success of the industry. It is thought that the Meon Valley was once a delta, one of the tributaries running through Funtley. The delta dried up, with consequent large quantities of clay being deposited. Although 500 years old next year, The 15th Century Great Funtley Farm carries its age with dignity and grace. -H.T.2939. Beyond the village itself, standing out boldly on the undulating downland, is an impressive building of brick and timber construction typical of the Elizabethan era. This was the Manor Farm of Titchfield Abbey, and was built in 1450, when the Abbey was flourishing. Despite its age, little outward change is evident in the house to-day. The building is still a farmhouse, known now as Great Funtley Farm, and the stamp of age and history is firmly embedded in the rambling precincts of the farm. For so small a place as Funtley it is surprising to find a social club in a village which boasts only one general shop. But the club is quite a centre for the community, and its building is a converted Army hut.